The week before last I talked about how I make some of the mechanical things for My Little Factory. A quick update on that: I have managed to make some progress on fabricating the escapements for the indexing conveyor, but I may have to turn some of the more delicate parts over to a machine shop. I have a prototype that works, but if I want it to be consistent and precise over all three of them I will need to leave it to the pros. This week’s topic concerns some of the electronics and prototyping I want to do that honestly falls outside of the typical industrial arena. 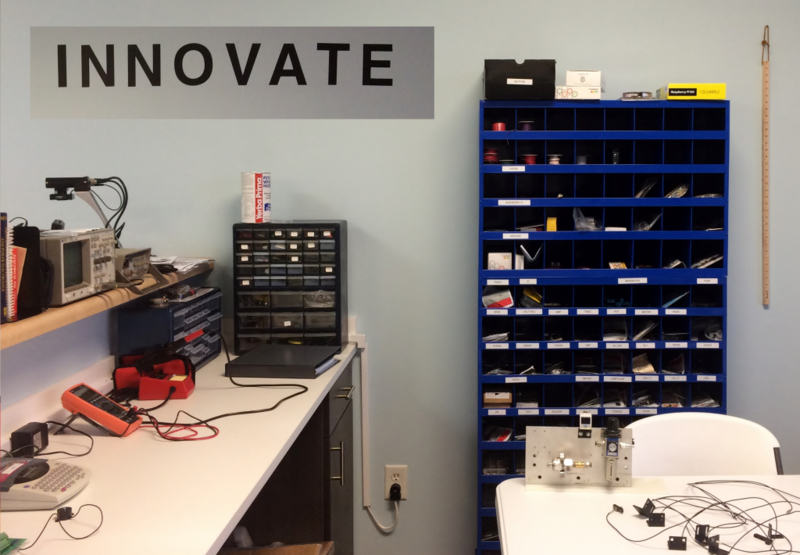 I took some liberties with the picture above; the “Innovate” sign is a bit up and to the right of the blue storage bins, but I wanted to get my workbench into the picture. This area is where I do my prototyping and board-level stuff. 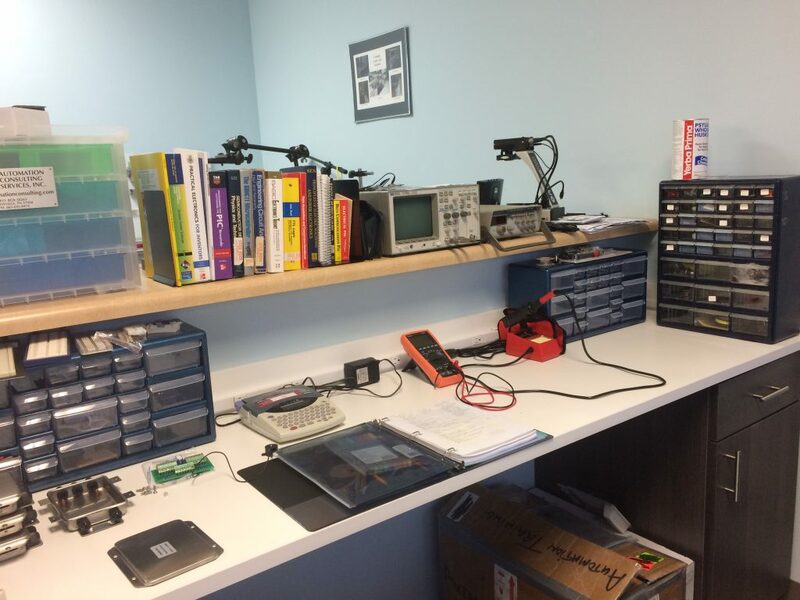 As you can see there are lots of storage areas, an oscilloscope and function generator, soldering station, and a small library of electronics resources. One of the things I am working on is converting the small millivolt-level load cell signals to a 0-10v input that can be used by a PLC. 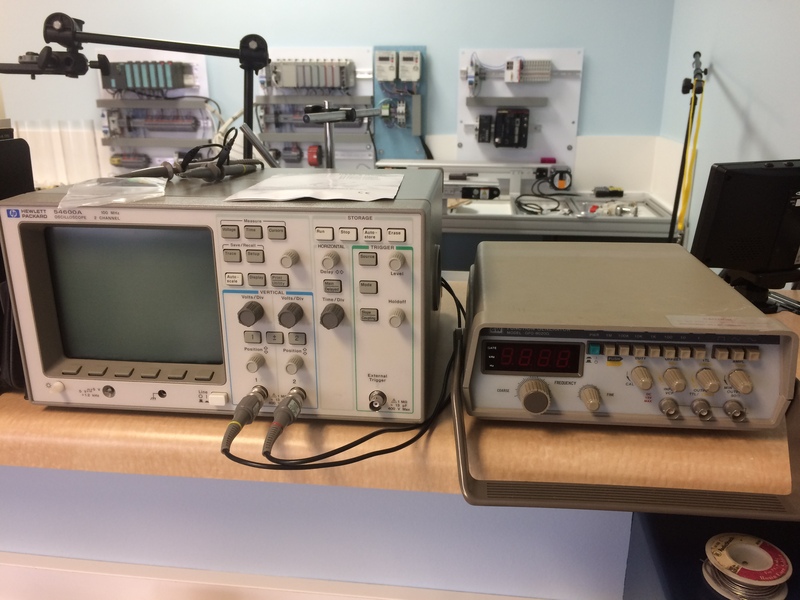 As I mentioned in my signal conditioning post a few weeks ago, this is done with summing boards and amplifiers, which are pretty standard methods in industry, but the equipment I have found online isn’t really suitable for a miniature factory. I am having cobble some things up and am revisiting some of my old Electrical Engineering and technician methods to fit everything in the way I want it. A bit of history on how I ended up with this innovation area in the first place. As some of you may know, Radio Shack has fallen on hard times in recent years. I had heard they were bankrupt several years ago, but several stores had stayed open in my area of Tennessee, including one at a mall in Nashville. It turns out they were bought by Sprint. A couple of years ago I walked in to check it out and noticed a lot of “maker” stuff related to the popular STEM programs kids are getting involved in in school. 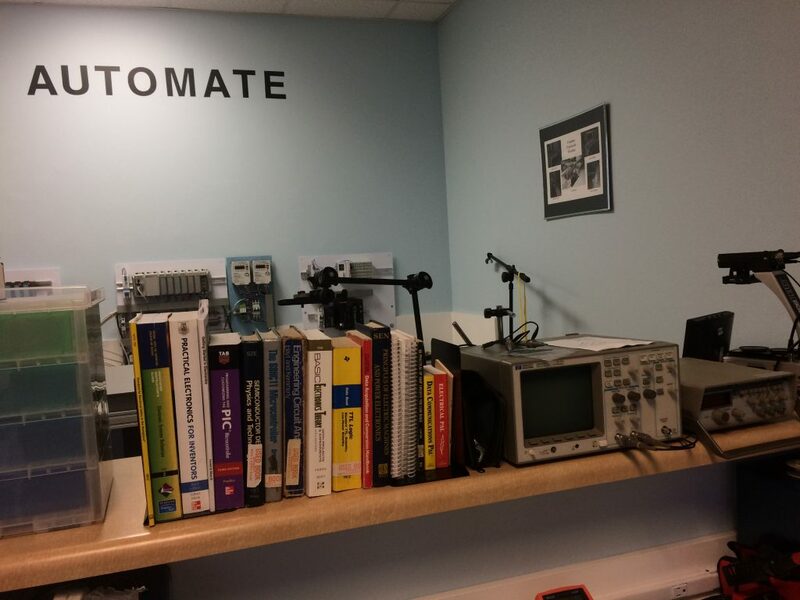 There were various Arduino related gadgets along with the typical electronic components you usually find in their bins; pretty overpriced compared to the things you can find online. I bought some of it anyway, hoping to get around to playing with it in the future; this was before I moved my office to this bigger facility closer to home. I’m afraid it languished in my garage until the past few months. Anyway, the last time I went to that mall there was a big sign on the door: Store Closing! Everything must Go! Long story short, I bought a LOT of their stuff, including some of their component bins. Then I went to all of the other local Radio Shacks and did the same thing. 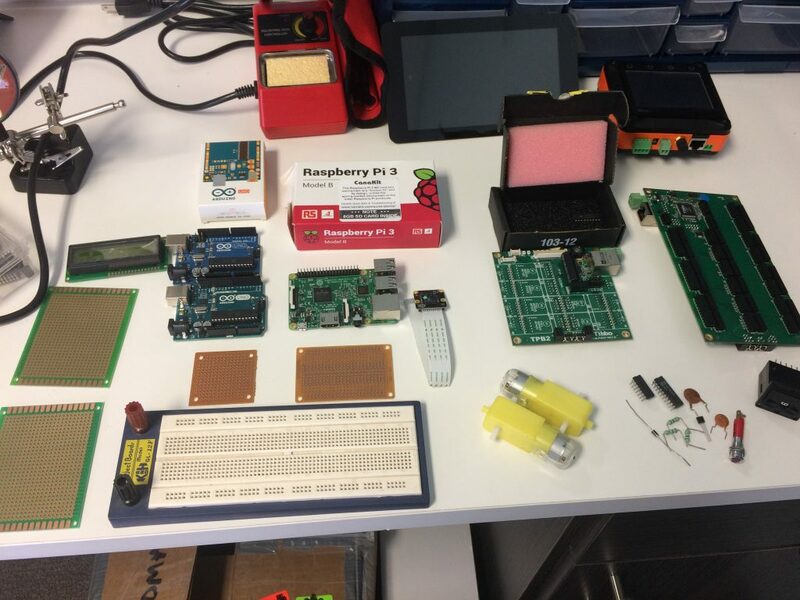 I’ve also mentioned the Tibbo and Raspberry Pi components I’ve been interested in. These small board controllers remind me of some of the projects I did in college, but processors have come a long way since then. Electrical Engineering students were required to build circuits using the HC6811C chip, using LEDs and discrete components to build simple control circuits and illustrate the use of low-level programming languages like Assembly. Now with the Industrial Internet of Things (IIOT) these controllers are finding their way into applications everywhere. This opened the door for me to produce customized classes for people interested in prototyping and inventing. It is difficult to make a lot of progress in this area until I have finished the industrial part of my classes, but I will soon be breadboarding some sensor circuits for demonstration purposes, and as I complete some of these microprojects they in turn will be making their way into more class materials. Until then, this area of my facility will be a fun place to try out some of the ideas I have had in the low voltage world. If you have been working with Arduino, Raspberry Pi or any circuit board level electronics projects, leave a comment!